4. A cloth sold to wipe spectacles or camera lenses will work. 5. 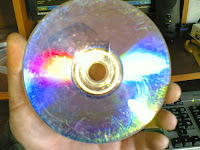 When you can no longersee the scratch,, wash the disc with water and let it dry before playing. 6.If polishing doesn’t work, apply a thin coat of Vaseline, shoe polish, or furniture wax to the CD’s playing surface.